Here's where to watch every episode of Supernanny season 3. Mouseover or tap an episode to see where to stream it. Click or tap the play icon to stream it on the best available service. Bowersock Family Dec 4, 2006 In the explosive third season premiere of Supernanny, Jo takes on the Bowerstock family, dealing with the high levels of aggression and stress in this household. Mom and dad need all the help they can get to tame their three wild kids, who literally laugh in mom's face when she tries to discipline them. Weinstein Family Dec 11, 2006 The Weinsteins need help. Dad David is a trucker, sometimes away from home as many as 10 days in a row, and stay-at-home mom Chia can’t control the children. When she tries to correct them, her kids respond by hitting and kicking her, cursing and other aggressive behavior. Fager Family Dec 18, 2006 In Supernanny's first-ever vacation episode, Jo Frost surprises the Fager family with a beachside holiday in Florida. Stacie and Joe Fager are the proud parents of a blended family in Iowa, but with six children, they both feel overwhelmed and exhausted. Joe is a truck driver and full-time student, and he’s gone most of the week. Stacie, a stay-at-home mom, has a hard time controlling the children, so she hardly ever leaves home with the kids in tow, and family vacations are a rarity. Swanson Family Jan 8, 2008 With five boisterous boys in a small house, Ken and Vania have reached the end of their rope - and possibly the end of their marriage. Vania has filed divorce papers and Jo Frost is the family’s last hope for reconciliation - if this doesn’t work, Vania will move forward with the divorce. Mihalik Family Jan 15, 2007 Donna Mihalik is a single mom who’s been through multiple ordeals over the last four years. Her son survived a two-year, all-consuming battle with leukemia. But soon afterwards, Donna’s husband Steve suddenly died. Left alone to bring up their four children, Donna was so depleted she lost control of the kids. Smith Family Jan 22, 2007 Marine biologists Will and Michelle Smith are clueless when it comes to raising their two sons, Nate, 3, and Ari, 18 months. The couple’s energy translates into endless fun for the boys – but discipline is non-existent and without a settled bedtime routine both children are keeping their parents up till late at night. Will and Michelle are worn out – can Supernanny help them find a solution or will they remain at the mercy of their boisterous boys? Haines Family Jan 29, 2007 Tiny tyrant Sean is the alpha male in the Haines family – and mom Suzanne, dad Shane and big brother Seth, 10, are wilting under his aggression. Crying, hitting, spitting, punching, kicking and biting are Sean’s preferred methods of communication and when Seth fights back it just makes things worse. Suzanne and Shane cope by opting out of parenthood and letting the boys get on with it – and boredom breeds mischief! 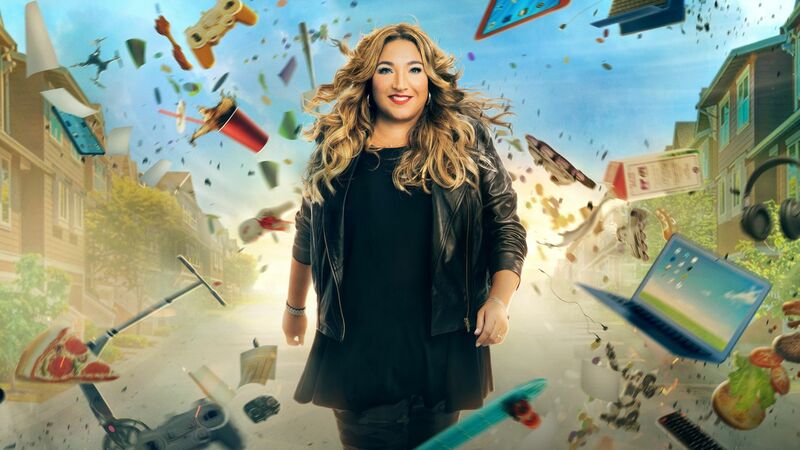 Can Supernanny help them re-connect with their kids and take back the power? Nitti Family Feb 6, 2007 The four Nitti boys are at war with each other and their Mom. Darren, 10, Matthew, 8, Devin, 6, and Jared, 5, are so violent they leave serious welts and scars on each other and their mom Lisa. Lisa doesn’t know how to manage her kids without resorting to anger or threats to call boyfriend John, who uses intimidation to tame the terrors. Mealtimes, car journeys and bedtimes are a disaster – but when Jo Frost tries to implement change, John constantly resists her techniques and angrily confronts her. Can Jo help this family stop the violence? Goins Family Feb 26, 2007 Karolee and Jay Goins have a beautiful young family with a not-so-pretty problem… Mom, pregnant with number four, is completely exhausted by her brood’s out-of-control behavior. Khalin, 7, has attention deficit/hyperactivity disorder (ADHD); Kolben, 5, is overly aggressive and little Kadance, 2, is learning all of her big brothers’ worst tricks. To make matters even more difficult for Karolee, dad Jay acts like a kid himself most of the time. Can Supernanny help Karolee turn things around – and get Dad more involved in parenting? Williams Family Mar 5, 2007 Single mom Jency Williams has three unruly children: Bradley (12 years old), Kelsey (10 years old), and Hagen (5 years old). Jency works two jobs to make ends meet, drops the children at her grandparents' house, so that they can take care of the kids while she is at work. The children are calm and respectful with their great-grandparents, Hal and Carolyn, who are in their seventies. Hal and Carolyn ask Supernanny, Jo Frost, to come and teach their granddaughter Jency to discipline her own children. Walker Family Mar 12, 2007 Anthony and Alice Walker have their hands full. They have three children – Anthony Jr, 12, Naleila, 6, and Alyssa, 17 months, plus Marcus, a nephew who lives with them full-time – and run a daycare business in their home. Mom’s outsized personality and attitude has rubbed off on the kids, and they’re doing whatever they want. Unsure of how to regain control, she resorts to chasing them around the house trying to mete out discipline. Anthony Jr is a master of backchat, and Naleila and Alyssa spend their nights snuggled up with Mom and Dad. Alice wants help to set boundaries… and Dad’s just looking for a good night’s sleep! Will Jo succeed in turning the Walkers around? Cantoni Family May 28, 2007 Jo tries to help an overwhelmed mother and a father who gives in to the bossiness of their three children. Amouri Family Aug 12, 2007 Jo helps a mother with four young children and a husband who's always out late with friends.